Festivals devoted to genre film, special topics and content that the mass film audience might consider exotic, are most precious for film museums such as the Slovenian Cinematheque. Not only do they enrich the screen, broaden and deepen our film horizons and – which is crucial! – enable a relevant contextualisation of the shown content, they are also an excellent »excuse« for the Cinematheque to display its museum collections and raise awareness about all that constitutes film heritage. In the case of Kurja polt, we can thus draw attention to one of the largest collections of the Slovenian Cinematheque – its collection of film posters. For this year’s exhibition, which is part of the From the Collection series, we prepared a selection of posters that we divided into two groups according to the programme topic – Repression and Revolt. The first group consists of posters for films with sociopolitical topics, while the second includes posters for films featuring rebels – in all the various senses of the word. The selection nicely shows how posters used to be diverse, how the quality of design and print used to vary and how, for individual genres, topics and content, common visual characteristics gradually developed. 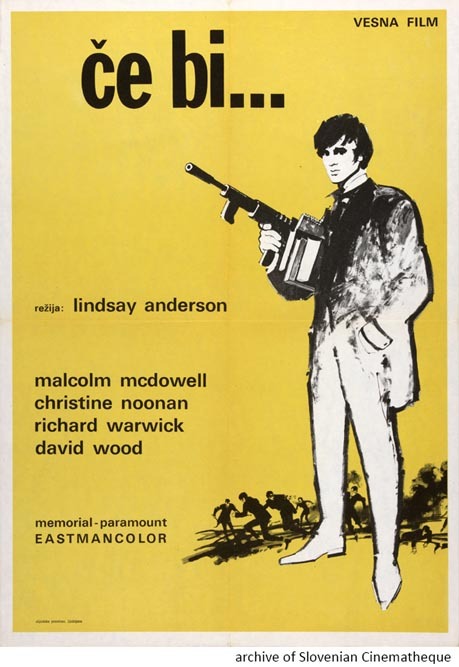 Let’s consider the central poster of this year’s exhibition for Lindsay Anderson’s If…. (1968). The poster has a simple design and addresses the viewer with minimal means: an intense colour plane, a black-and-white illustration and only the most essential text. It relies entirely on the figure of a young man placed along the edge of the poster; his gaze and weapon are that which first catches the viewer’s eye. In the background, at his feet, there is chaos and smoke, but his stance is perfectly calm, with his hand in his pocket. An attentive viewer will also notice the books under the arm holding the weapon. This simple detail is the central message, which summarises and at the same time reveals the film’s content. It is a textbook example of how an imaginative illustration and visually refined design can make an effective film poster. In the spirit of this year’s topic, the poster also conveys that sometimes a book as a weapon is no longer enough. The collection holds almost 20,000 posters.